Every Trinity Student faces the age-old dilemma at some point in their Trinity College career – Max Burger or Plan B Burger Bar? Some, are indifferent. Others are passionately loyal to their favorite upscale burger joint. 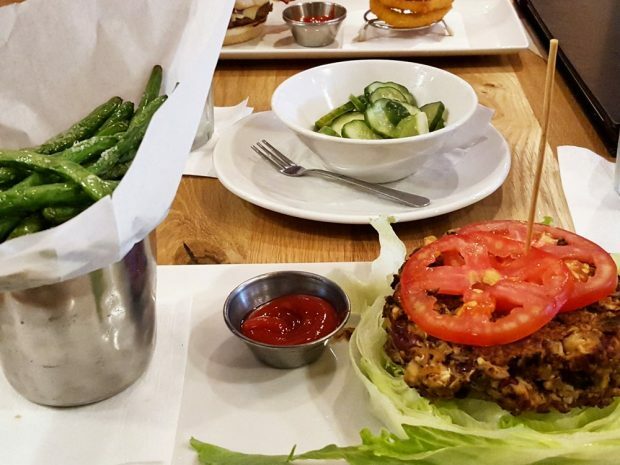 I happened to visit both Max Burger and Plan B Burger Bar within a 48-hour time span, which puts me in a well-equipped position to offer an opinion on the West Hartford burger rivalry. The two restaurants are quite similar, however their small differences make them unique dining experiences. The atmosphere of Max Burger is lively and cozy. The restaurant sprawls across 1.5 levels and the dining area is larger than Plan B’s. There is a bar area, as well as an outdoor terrace. Specials are inscribed on chalkboards throughout the restaurant. TV’s and trendy farm-inspired art decorate the walls. The dining area has a slight upscale feel for a burger joint. Plan B Burger Bar offers a similar experience, with relaxed lighting, chalkboard specials, and somewhat rustic décor. Plan B also offers outdoor and indoor seating and has a bar area. Plan B’s atmosphere is overall a bit more casual than Max Burger’s. The menus of both restaurants are what you would expect of an upscale burger restaurant. Burgers are the star of the menu. Additionally, there are many other bar-fare type appetizers, as well as sandwiches, and a few classic comfort food dishes. Plan B and Max Burger both feature classic burgers and an extensive variety of creative burgers. Max Burger has options like the “Fatty Melt,” which features a bacon cheeseburger with grilled cheese sandwiches as buns. Plan B features the “New Englander,” which is topped with lobster, smoked gouda, caramelized onion and a corn spread. Plan B wins the appetizer category with their delicious and addicting “blue chips”. This appetizer consists of house-made potato chips topped with tomatoes, warm blue cheese sauce, bacon, red onion & jalapeños. However, Max Burger’s appetizers are nothing to sneeze at. With options like pulled pork spring rolls, Max brings creativity and great taste. Now to the most important part: the burgers. Both burgers are extremely delicious, but there are a few differences. Max uses buns that are more buttery, while Plan B’s are drier. The burgers at Max are denser and chewier than Plan B’s. Plan B’s burgers tend to have lighter consistency, and, as a result, fall apart. The flavor of Plan B’s burger also seems to be fresher than Max, with Max’s heavier flavor. Overall the quality of the meat is higher at Plan B. This freshness has some spillover consequences for the structural integrity of the burger, since they tend to fall apart. Nevertheless, the fresh flavor is well worth the added mess. Both Max and Plan B offer several varieties of French fry types to accompany the burgers. Truffle, parmesan, sweet potato, and traditional fries are all options. The fries at both restaurants are comparable in quality. Max fries tend to be larger, and Plan B’s are thinner. One major difference is that Max serves all fries with a garlic aioli dipping sauce that is an amazing addition to anything on your plate. It goes especially well with the sweet potato fries. Both restaurants feature an extensive beer selection. Plan B’s selection of beers on tap is more diverse. In addition, they place more of an emphasis on craft beers. Plan B offers flights of their beers on tap so that you can choose to sample a variety. Prices are comparable at Max Burger and Plan B Burger Bar. Burgers range from $11-$15, depending on the toppings you select. Fries are complimentary at both restaurants. Appetizers are similarly priced, at around $10 at both locales. Overall, Max and Plan B are both great spots to enjoy high quality burgers, bar fare, and a good selection of craft beers. With similar décor and menus it can be hard to pick between the two when you are selecting a restaurant. After visiting both within a two-day period, I think that the advantage goes to Plan B Burger Bar, on account of its overall experience. The deciding factor really comes down to the burger quality. At Plan B, there is a freshness that sets their burgers apart.